We met thirty years ago. In Salzburg. I had traveled from Tübingen, but Peter had, from the beginning, perceived me as someone from the Balkans. In his mind I was a Serbo-Croat. That is how he introduced me to several of his companions (Martin Lüdke, Marie Colbin). In those days, the greater Yugoslavia still seemed “stable.” Peter’s neologism, Serbo-Croat, might well have been invented for me alone. I was, at that time, a de facto Yugoslav, born and raised in Serbia, and Serbo-Croat was my native language. Peter’s views and formulations seemed to me, at that first meeting and then repeatedly over the years, at least ambiguous. They raise questions, stimulate discussion, disassociate positions, lead at times to intense rows. Back then, in the bar of the Salzburg Sheraton, didn’t silence, rather than conflict, mark the caesuras of our discussion? Subsequently in the Greek restaurant, didn’t it come, thrust by thrust, to embittered verbal conflicts (about what?)? Didn’t the evening and our meeting end in altercations with the police and with the arrest of the writer, who was required to go to the police station? 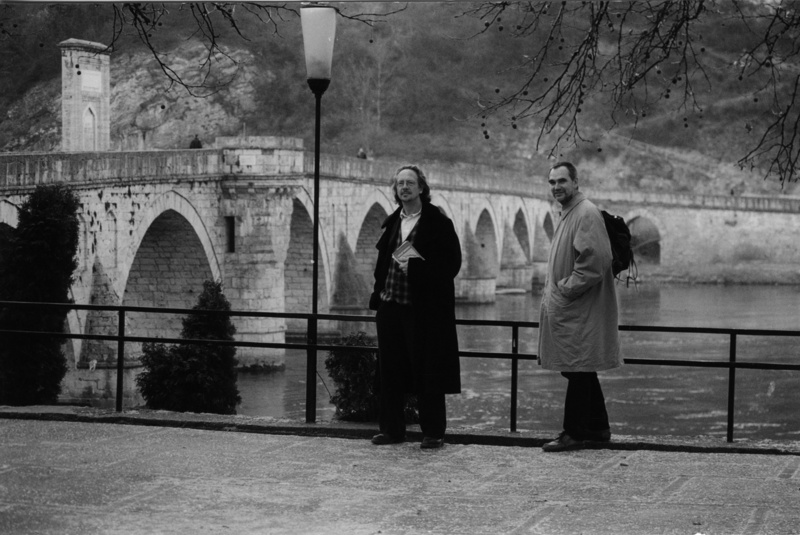 My first meeting with Peter Handke lives on in my memory like a gripping feature film in which the two of us played the main roles, directed the film, composed the music, and wrote the screenplay. It was, in the fullest sense of the word, an encounter between “authors.” In the end we also spoke about films, referred to Godard and Éric Rohmer, argued about cinematic aesthetics, were reconciled again, and so on. At that time Peter was working on books that became, for me, key works of this creative phase: Repetition, Absence, The Afternoon of a Writer. Later, while translating The Afternoon of a Writer, a feeling arose like the one at our first meeting in Salzburg; it was as if we were ranging again through the streets in search of a place where we could talk in peace, and I realized that all paths, in Handke’s books as well, lead to the city’s outskirts. My thoughts today – Isn’t it one of the duties of a translator, before or during the translation, to go to the site of the events described in the translated book? Isn’t that why I later, together with the Handke translator into English, the American Scott Abbott, traveled through Carinthia and Slovenia, the scenes of Handke’s Repetition and also of the later play Still Storm, which I am currently translating? I continue my deliberations: Doesn’t every translator dream of strolling with his author through the real sites where the book he is translating plays out? The translator of Franz Kafka, I imagine, would give anything to wander for a quarter of an hour with his author through the Prague that is much more than a backdrop in many Kafka texts. In this context I ask myself: Am I not the most privileged translator of all? Since 1995, I have undertaken trips, sometimes several in a year, with the author of the books that I translate. Together we visited places that I later, while translating, remembered. Translating, I could say: “Yes, that’s exactly how it was,” or: “No, here the writer is diverging from reality.” Thanks to the shared travels, I can pinpoint the places where the real world and the world of fiction differ. I remember as if it were yesterday a discussion in Bor, a city in eastern Serbia. We sat in a snack bar across from the gate to a mine. It was a shack, patched together out of plywood and tin. In spite of the improvisations undertaken by the builder of this soon-familiar pub, it was pleasant inside. Posters with soccer players or pin-up girls hung on the walls along with a portrait of the former head-of-state Josip Broz Tito. On the table stood a pitcher of excellent local white wine, and we – Zlatko B., Peter Handke, and I – crowded around it like sheep in the shadow of a tree under oppressive heat. It was cold outside. We felt sheltered. Quiet, but audible Serbian folk music sounded from the radio. We sat like dwarves on stools, none of which resembled the others, each one a different height. We watched the waitress, pretty as a picture, her demeanor proud, and recounted our love affairs, secret ones as well as the public ones. Later, while I translated Don Juan (his own version), I recognized details from that discussion, recognized us as we lingered there in the little city of Bor on that unusual evening, perhaps there for the purpose of that novella. In search of a motif, of heroes, of future stories. Weren’t Handke’s travels, with me or without me, “educational journeys,” preparatory work for his writing? Wasn’t that the case in Velika Plana on the Morawa River, in Bajina Bašta on the Drina, in Smederevo on the Danube, and in Zemun, my hometown that also lies on the Danube? In Srebrenica, as well, especially because everything was already known about it; we were there to experience what was not being reported: how the dry spring wind ripped loose the plastic bags that had become caught in broken windowpanes, the empty gaze of passersby in the streets of the city of ghosts, a stillness like that after a sonic boom, only in the opposite temporal direction, it boomed us into the dark past, into eternal strife and doubt. The laws of narration are pitiless because the words of a story also recount what is not spoken, and because they confuse the reader not used to “digression,” even when the words repeat what is all-too-well known. One thing is sure: If I had not come to know Peter Handke personally, I would experience his books always as reports of travels in places that I would immediately want to visit myself. Because I was with the writer in the scenes of his narrations before they entered his writing, I know the deep truth of his texts. I once saw joy in the eyes of a reader of The Moravian Night (a story with origins on the Morawa River). “In the book lots of things are different, but while reading I suddenly wanted to go home,” he said to me. And I am convinced that even the readers in Handke’s birthplace Griffen who accused him of having watched them playing soccer and having then used them as material for The Goalie’s Anxiety at the Penalty Kick, were proud that they, even if in another form, were mentioned in the book. Just as Zlatko and I perked up when we, in the Moravian night – Zlatko while reading, I while translating – came upon the line “each one sat at his table,” exactly like it had been when the three of us sat on the deck of the Moravian hotel ship where we had spent the night, on the morning after a bitter conflict during which one word had led to another. Each of us ate breakfast alone, each at a separate table, and we were silent for a long time; later, of course, we made up, delicately resumed contact, showed one another affection and respect. After thirty years of friendship with Peter Handke, I am still impressed with the writer’s sharp sight that gives rise to his fascinating depictions, true images of the experiences that are the heart of all narration. I am still deeply moved by Handke’s unerring consistency in selecting from experience the images he depicts. The landscapes through which we traveled, and also the ones I myself did not travel in, are for me, as described in Handke’s books, like the white spots in the field of vision after strong pressure on my eyelids, and at the same time like the gentle breath of air that brushes over them. Didn’t I, Handke’s translator, experience these images during the wars in the Balkans as a rescuing light at the end of the tunnel full of horror? Remarkable images from Alaska, Griffen, Paris, Bajina Bašta, Porodin, Zemun, Logroño, Thessaloniki, from the mountain ranges of Fruška Gora, Sierra de Gredos, Saint Victoire, and of the Harz, from Daimiel, Majdanpek, Sokolac, the island of Krk, the villiage of Tomaj, from Damascus, Sarajevo, Trebinje, the Japanese Aomori, Split, München, Salzburg. Naturally also from Velika Hoča in Kosovo, where Peter Handke – or did I only dream that? – will celebrate his 70th birthday today; raw material for a new story . . .
Žarko Radaković, born in 1947, is a writer and translator. He has lived in Germany since 1978, first in Tübingen, since 1990 in Cologne. He studied world literature in Belgrade and German Studies, art history, and philosophy in Tübingen. He has published seven novels and two volumes of stories in Belgrade. Two of his books will soon appear in New York (Repetition and Vampires & A Reasonable Dictionary, both with Scott Abbott — Punctum Books). David Albahari calls him the most radical contemporary Serbian writer. For more than two decades, Radaković has translated Peter Handke into Serbian – 24 translations and counting. This entry was posted in Uncategorized and tagged Peter Handke, translation, travel, Zarko Radakovic. Bookmark the permalink. Radakovic is right certainly about Handke as an image collector. However, he is not on top of the news about where Handke is celebrating his 70th, it is in Griffen,for being made an honorary citizen I think but also in Salzburg? and for having a Bruno in him! Michael, you missed the playfulness of the ending — “or did I only dream that?”.